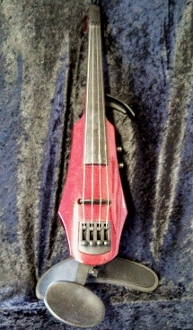 This full size electric violin for sale was made in 2008 in the Czech Republic by the Ned Steinberger "NS Design" company. The model, the NS WAV, is their entry level model. This particular NS Design WAV Electric Violin has a red wood body. It has an ebony fingerboard and maple bridge for increased playability and similarity to a wooden violin. The body is narrow so as to decrease the weight of the instrument to that of a standard violin. There is no difficulty with this instrument due to weight and size. This brand new violin can be hooked into standard electronic equipment and can also be used as a practice violin without amplification. The NS WAV violin is new and comes with an appropriate case for the violin. For $750.00, this instrument would make an excellent violin for a player looking to play in a band or who otherwise needs an amplified violin.